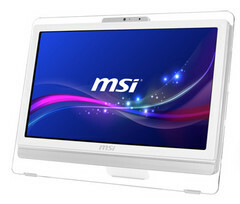 MSI recently announced the AE200 all-in-one “entertainment system” in Taipei. The new device features a 19.5-inch 1600 x 900 anti-glare LED display, an AMD E2-3000 processor, AMD Radeon HD 8280 graphics, 4 to 8 GB of RAM, up to a 1 TB hard drive, a 1 MP front-facing camera, 802.11 b/g/n wifi, an optical drive, a card reader, 2 USB 3.0 ports, 4 USB 2.0 ports, an HDMI port, an Ethernet port, and a TV tuner. 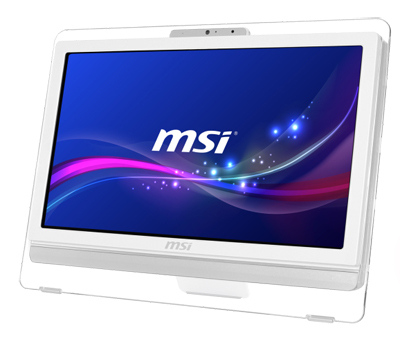 MSI promises that its new display will cause less eye strain and fatigue by reducing glare and flickering, and by cutting down on blue light. Whether this will affect image quality and color accuracy is not clear. Surprisingly, the new AIO is listed as running Windows 7 Home Premium, and not Windows 8 which would seem better suited to a touch screen device. Unlike some other recent releases like the Sony VAIO Tap 21, the AE200 is not trying to be an oversized tablet. It weighs twice as much as the Sony - a hefty 16.8 pounds, and is clearly not intended to be moved around. Prices and availability have not yet been announced. As the device was first announced in Taiwan though, it's probably a safe bet that Asian markets will see it first.